Cha-Ching! Social Commerce is on the Rise – the ajayi effect. Recently, there’s been a plethora of new marketing products like “buy buttons,” product pages and other commerce-oriented features from social players. From Pinterest and Instagram launching essentially identical features on the same day to YouTube’s efforts to drive traffic from video ads, it’s been an interesting month to watch social commerce unfold. It will also be worth keeping tabs on the platforms that pay off the most for brands this year, especially during the holiday shopping season that starts in a few months. Twitter rolled out product pages last week, which are like mini e-commerce hubs that live on the microblogging site. By pulling together tweets about brands and products, Twitter hopes people will spend a little extra time researching products before buying something based on social chatter. The San Francisco, Calif., company’s new effort also incorporates Twitter’s buy button that launched in September so people can check out straight from the site. 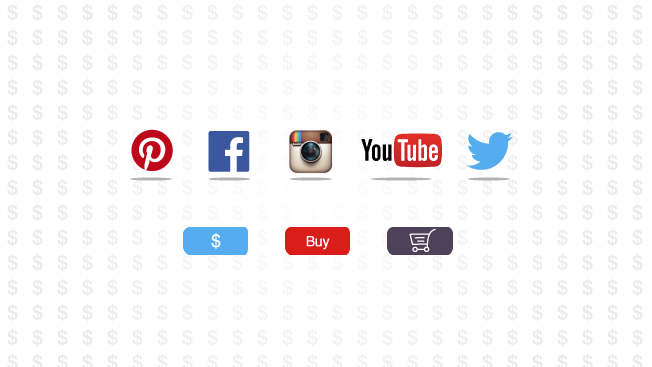 The San Francisco-based platform’s “buyable pin” buttons let users purchase anything they see on the site. It’s a feature that’s been in the works for a long time to help brands understand how their content drives online sales outside of Pinterest. The Menlo Park, Calif.-based company started testing buy buttons with a handful of retailers last year and recently expanded the program to include more brands. The click-to-buy button is powered by Shopify, a company that runs e-commerce for small merchants like Tattly and Packer Shoes. Brands can use Facebook e-commerce in posts they upload or in their ads. To buy something, people either type their credit card number directly into Facebook or store their payment information to check out more quickly. Brands asked for e-commerce, and the Facebook-owned app finally pulled the trigger earlier this month with “Shop Now” buttons. E-commerce is only open to advertisers initially, so brands that solely use Instagram to post photos and videos can’t test it out. The e-commerce button connects ads to websites where users can shop, making it a seeming gold mine for fashion and luxury brands that regularly promote individual products. The Web video giant is betting that people will shop instead of skip ads if they are given the choice. In May, YouTube rolled out a souped-up version of its TrueView product that places a shopping button directly across the screen from an option to skip a pre-roll ad. Clicking through on the shopping button leads to a website featuring the products in the ad, and people can then put products into a shopping cart.